The Jetta GLI ups the performance ante with more power, sharper handling, and features shared with Golf GTI and Golf R.
Standard LED projector headlamps flank a black honeycomb grille with red accent line that harkens to the GTI. Golf R brakes, with red-painted calipers, stand out in the sleek 18-inch aluminium-alloy wheels that are exclusive to GLI. In the rear, standard LED taillights are joined by a spoiler and unique rear bumper with finned diffusor and dual chrome exhaust tips to give it a truly unique rear view. 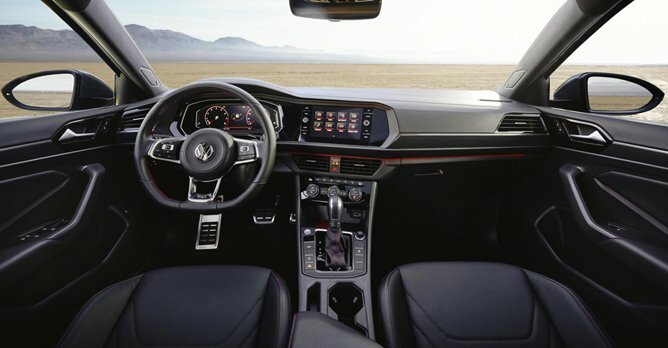 Inside, the GLI transforms the Jetta's modern cabin with nods to the Volkswagen performance family. A black interior sets the stage for red accents to pop throughout - red stitching is used on the steering wheel, shifter, armrest and floormats. Comfort sport seats feature red stitching no matter the material; cloth seats on the base model add grey piping, while red accents peek out of the Autobahn's perforated leather seats. Diamond flag decor trim reinforces the sporty nature of the car, as does the standard leather-wrapped sport multi-function steering wheel and available sport HMI display from the GTI. The 2019 GLI is powered by Volkswagen's 2.0-litre turbocharged and direct-injection EA888 TSI engine, making 227bhp. This engine, shared with GTI, features variable valve timing on the intake and exhaust sides, as well as variable exhaust valve lift. The power is taken to the front wheels via a standard six-speed manual transmission, with an available seven-speed DSG dual-clutch automatic transmission.